Credit: Hyldmar, He & Prorok. A team of researchers at The University of Cambridge has recently introduced a unique experimental testbed that could be used for experiments in cooperative driving. This testbed, presented in a paper pre-published on arXiv, consists of 16 miniature Ackermann-steering vehicles called Cambridge Minicars. "Using true-scale facilities for vehicle testbeds is expensive and requires a vast amount of space," Amanda Prorok. "Our main objective was to build a low-cost, multi-vehicle experimental setup that is easy to maintain and that is easy to use to prototype new autonomous driving algorithms. In particular, we were interested in testing and tangibly demonstrating the benefits of cooperative driving on multi-lane road topographies." Studies investigating cooperative driving are often expensive and time consuming due to a lack of available low-cost platforms that researchers can use to test their systems and algorithms. Prorok and her colleagues thus set out to develop an effective and inexpensive experimental testbed that could ultimately support research into cooperative driving and multi-car navigation. "Our testbed architecture is designed for ease of use, and our key aim is the rapid development and testing of driving behaviors on car-like robots, such as the Minicar," Prorok explained. "For this reason, we base the system control on an off-board (external) workstation that controls each Minicar individually." Prorok and her colleagues designed a miniature robotic car called the Cambridge Minicar. Their testbed includes 16 Cambridge Minicars, as well as a technique for path planning and motion control. Their path-planning algorithm uses positioning feedback, which is measured by an external motion capture system, as well information about the lane topography. Using this information, the workstation computes trajectories (i.e. the desired velocity and steering control inputs) for all vehicles. These values are then transmitted to the vehicles over broadband radio. "We also use the positioning information measured by the motion capture system to deduce which cars are 'neighbors' (i.e., are close to each other on the lanes)," Prorok added. "This information is then fed into our algorithms, which emulate decentralized control and vehicle-to-vehicle communication. Our setup scales very easily to large numbers of Minicars. Hence, it lends itself naturally to testing cooperative driving strategies in systems composed of large numbers of vehicles." The experimental testbed developed by Prorok and her colleagues can be used to implement state-of-the-art driver models and autonomous control strategies, evaluating their effectiveness in a realistic setup. 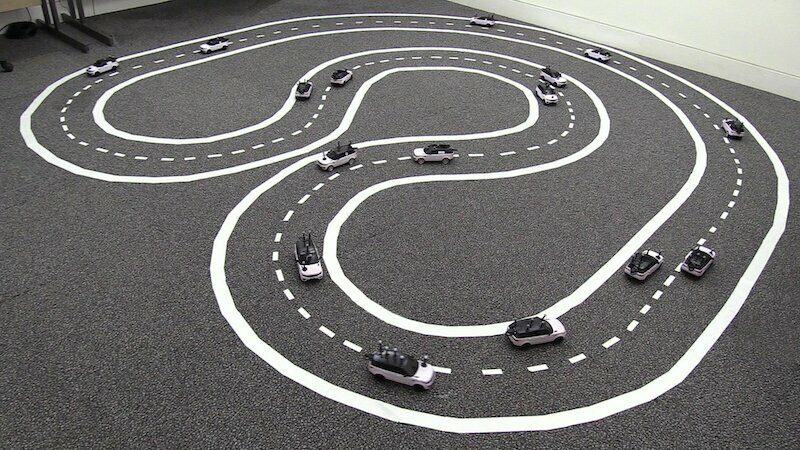 In their study, the researchers carried out a series of experiments on their miniature highway, demonstrating the benefits of cooperative driving on multi-lane roads. "Our experimental testbed is unique in its size, scale and cost," Prorok said. "The Minicar is one out of very few openly available designs; it fills a price-range gap, and is especially attractive for robotics labs that already possess telemetry infrastructure, such as motion capture. The testbed allowed us to test various driving behaviors in a way that has not been done." The advantages of cooperative driving have never really been demonstrated in physical setups of this kind. In the experiments using their testbed, Prorok and her colleagues found that cooperative driving can increase throughput by up to 42 percent. These findings are highly encouraging and could motivate further research into multi-car navigation and cooperative driving. "Cooperative driving strategies hold a lot of promise for the future of traffic," Prorok said. "However, more work still needs to be done in order to truly transition from a lab environment into the real world."